Indiagames Ltd, the triple play (PC, mobile, DTH) gaming subsidiary of media and entertainment group UTV, has reported a financial turnaround, posting a net profit of Rs 2.47 crore in the fiscal year ended March 2011 against net loss of Rs 3.49 crore in the previous fiscal. The company experienced high traction in mobile gaming and a 3.57x rise in revenues of its Games on Demand business last fiscal. Total revenues for Indiagames grew 37 per cent year-on-year to Rs 54.5 crore while operating revenues rose from Rs 37.7 crore in fiscal 2010 to Rs 52.3 crore in fiscal 2011. Mobile gaming contributed a little over two thirds of the company's revenue with games such as DLF IPL T20, T20Fever and Bruce Lee distributed both in the domestic as well as international markets. The mobile segment comprises of mobile content, advertising on mobile WAP portals and mobile games as well as sale of goods as a master service provider. In the fiscal ended March 31, 2011, mobile gaming revenues rose 20.7 per cent from Rs 35.2 crore in the previous fiscal to Rs 42.5 crore. During the fiscal, Indiagames launched a games subscription pack through six operators. Top domestic gaming titles launched in the year include Jungle Book, Toy Story and Tees Maar Khan. Internationally, the segment has reported a 42 per cent annual growth with titles such as Bruce Lee, Cricket World Cup Fever, Terror Attack and Garfield Train Your Brain. The company also offers 300 PC games under subscription plans through its Games on Demand (GoD) service. This service now has 80,000 subscribers and has reported a profit, according to the company. The division registered a 3.57x in revenues to Rs 8.18 crore in the fiscal ended June 2011 from Rs 2.29 crore in FY2010. Then there are DTH games, which the company launched in the fiscal via Reliance Big TV and Airtel Digital. Indiagames has strategically partnered with Oberon Media, a casual games company, to venture into this nascent market. The service launched on Airtel Digital in December 2010 crossed 30,000 subscribers in March 2011. The company employs 118 in its development studio in Mumbai. In the next fiscal, the subsidiary plans to launch a rural gaming initiative. 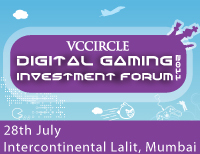 Vishal Gondal, Founder & CEO, Indiagames Ltd, is one of our featured speakers at VCCircle's upcoming Digital Gaming Investment Forum, set to be held on July 28 in Mumbai.